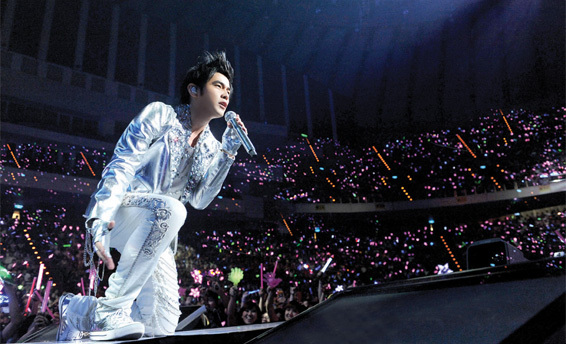 29 March 2012, Singapore – Asia's reigning R&B king JAY CHOU will be staging a one-night only race-themed concert on Friday, 21 September at the Marina Bay Street Circuit. Chou is the latest addition to Singapore GP’s stellar entertainment line-up, following the recent announcement that Maroon 5 will perform on the Saturday. Fans can access both concerts at the Padang stage as well as all other entertainment in Zone 4 with any 2012 FORMULA 1 SINGTEL SINGAPORE GRAND PRIX ticket, priced from S$178 for a three-day Zone 4 Walkabout. Jay Chou’s latest album Exclamation Point (驚嘆號) that combines Middle Eastern tones with American rap, Peking Opera and beatboxing is as remarkable as the man’s ability to play multiple musical instruments, win acting accolades, run his own record label, write one chart-topping hit after another, and release a total of 11 best-selling albums throughout a 12-year-long career. Jay Chou's last Singapore solo show as part of his 2010 World Tour sold out three nights at the Singapore Stadium within hours of going on sale. The Initial D star whose penchant for fast cars amassed a strong following from Asian motor-heads. Jay will be staging the one-off show spectacular post the on-track race action on the Friday evening of the F1 weekend; the set and show will be specifically designed and created for the 50,000 capacity Padang venue at the Singapore Marina Bay Circuit Park. He is the first Chinese artiste to grace the main stage. Singapore GP will be announcing additional artistes in the coming months. For updates on the latest entertainment schedule, visit www.singaporegp.sg. For the ultimate concert experience, fans can watch Jay Chou on Friday and Maroon 5 on Saturday up-close at a specially demarcated Fan Zone right in front of the Padang stage. 2,000 Fan Zone wristbands, which provide guaranteed access to the Fan Zone, are up for grabs per day. Early-bird ticketholders just need to register their ticket transaction number (listed on the confirmation email or receipt) on the Fan Zone page on www.singaporegp.sg. The number of wristbands given to each registered patron will be equivalent to the number of tickets purchased. For example, a patron who purchased 10 tickets under the same transaction number will receive 10 Fan Zone wristbands. This offer will end once all 2,000 wristbands have been redeemed for each day. Just purchase any pair of Formula One tickets during the early-bird phase and stand a chance to win a pair of exclusive passes to Jay Chou and Maroon 5’s Meet & Greet sessions. There are six pairs of passes to be given away for each artiste’s Meet & Greet event. To participate in the lucky draw, early-bird ticketholders just need to register their ticket transaction number on the Meet & Greet contest page on www.singaporegp.sg by 30 April 2012 (11.59pm, Singapore time). During the early-bird phase (now until 30 April 2012), tickets are priced from S$178 for a three-day Zone 4 Walkabout ticket to S$1,088 for a three-day Pit Grandstand ticket. By taking advantage of the Group Booking Special available for Pit, Padang, Bay and Esplanade Waterfront Grandstands, patrons can enjoy up to 30% savings. Limited combination packages are also available which allow patrons to experience different parts of the circuit over three days. Tickets for the 2012 FORMULA 1 SINGTEL SINGAPORE GRAND PRIX are available for sale online at www.singaporegp.sg, via the ticketing hotline +65 6738 6738 as well as at all SISTIC outlets.